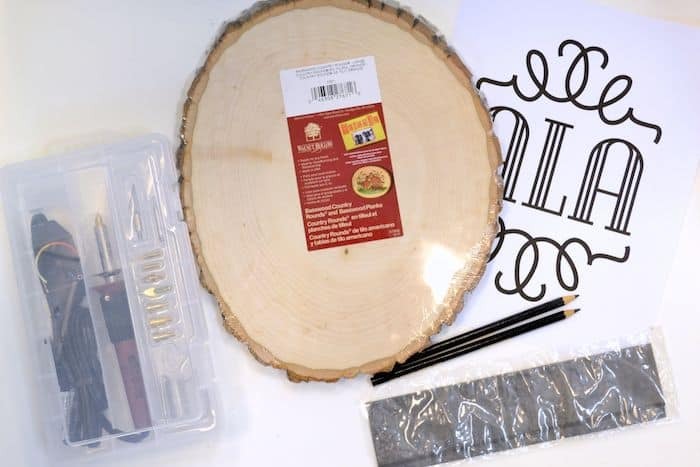 Are you ready to try wood burning? I give you my top tips in this article, and show you how I made a monogram plaque. I absolutely love the results! 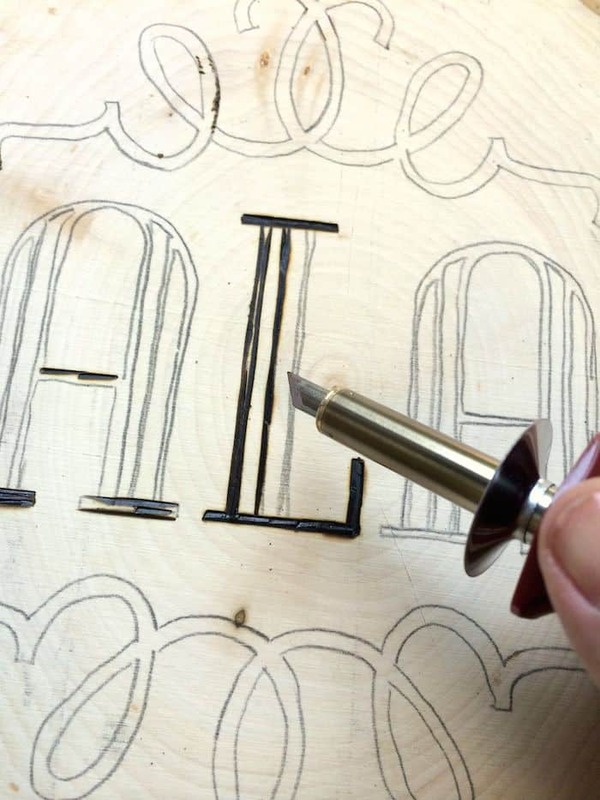 I’ve just recently attempted wood burning for the first time when I made the Wood Burning Monogram Plaque (see the tutorial below, and it’s not intuitive – but it is fun! 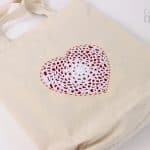 There are so many beautiful projects you can make, just with a piece of wood and a special wood burning tool. Literally almost any design you can imagine can be transferred to a piece of wood and then burned onto a surface. It has temperature control, a comfort grip, and 11 interchangeable points. It’s the one I use. 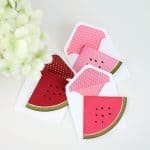 I’ve not used it, but online reviews are strong for this product so I think you can feel comfortable with it. On the left are Walnut Hollow alphabets. 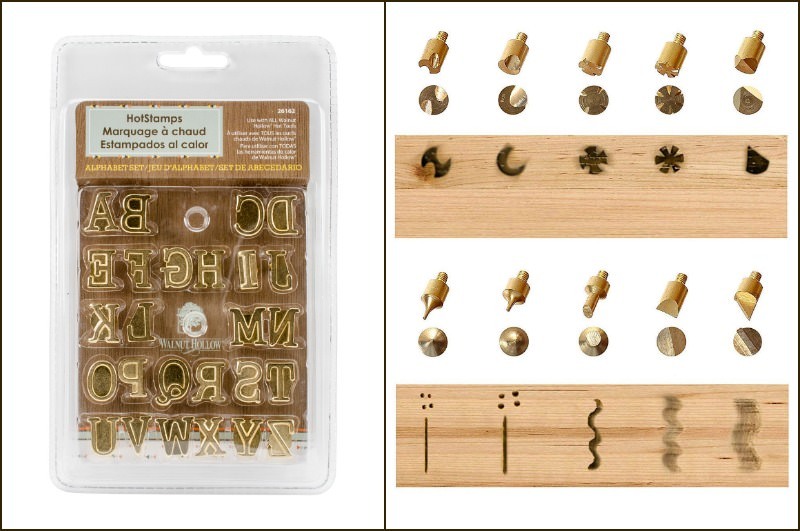 You can use these to stamp letters instead of drawing them! On the right are tip and stencil kits. There are a variety online for a great price. My first thought was how to change the letters on a hot tool while working? You do it with pliers. I find both of these kits to be invaluable! 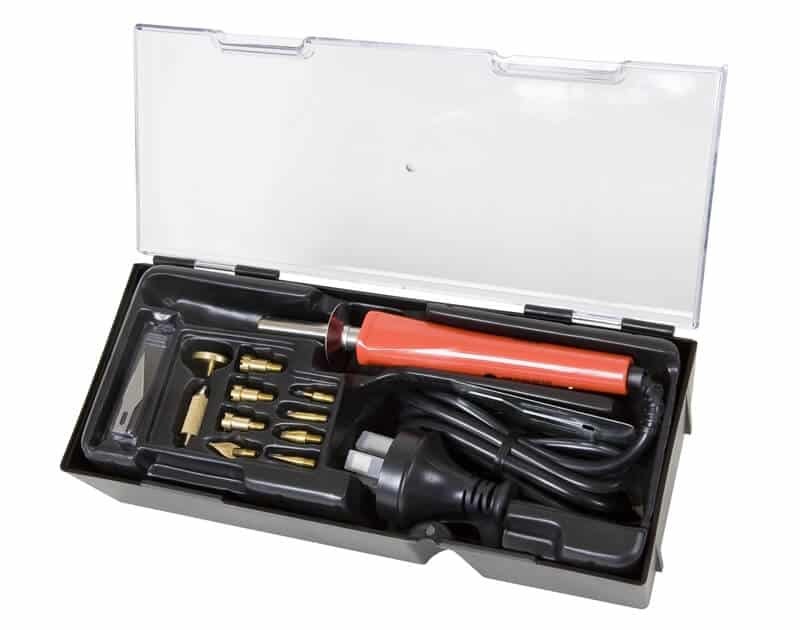 They are nice little accessory kits to add to your craft. So, those are the tools. Are you ready to burn (that sounds so ominous)?? During my first project, I learned a lot about how to wood burn and I’ve put together a list of my top tips so that you can try it as well. After you practice for a while, you’re going to have a blast – I promise! 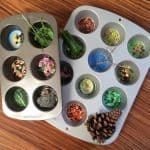 Here are my tips! Test It Out: Before you get started on your “real” project, try a sample piece of wood. You don’t want to begin your final piece without a little practice. Prepped Work Area: Make sure to fully prepare and cover your work surface. A wood burning tool is very hot, so don’t have anything that could possibly melt nearby. Take Your Time: Let the wood burning tool do the work and move slowly; don’t try to push it or force it. You risk bending the tip (which isn’t that difficult because the tip is so hot). Now that you’ve gotten my tips above, I want to show you my first wood burning project! 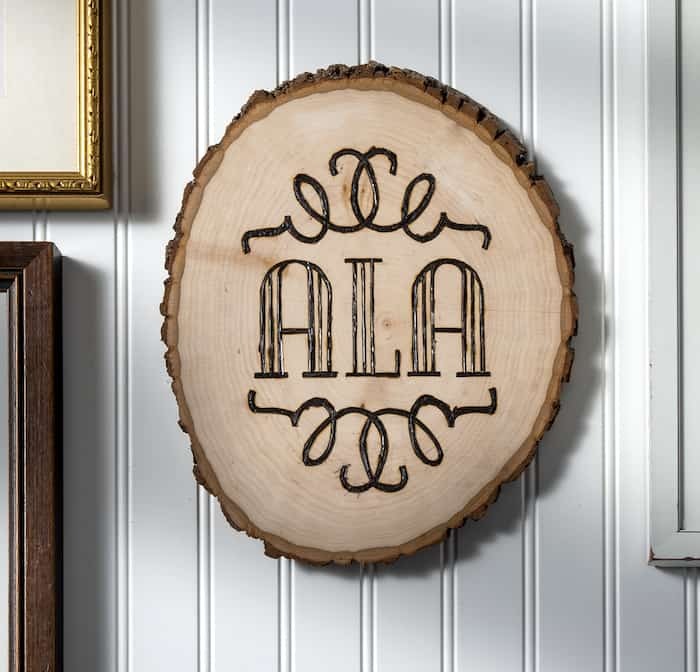 My first project to tackle was a wood plaque with my initials on it – I think a monogram piece is something anyone would like to try and display in their home. I particularly love the wood plaque that I used for the burning. It’s a real slice of a tree, with the bark and everything! It adds a woodsy and natural touch to any décor . . . and it smells good while you are burning it! The first step is to design your monogram on your computer in a word processing program. 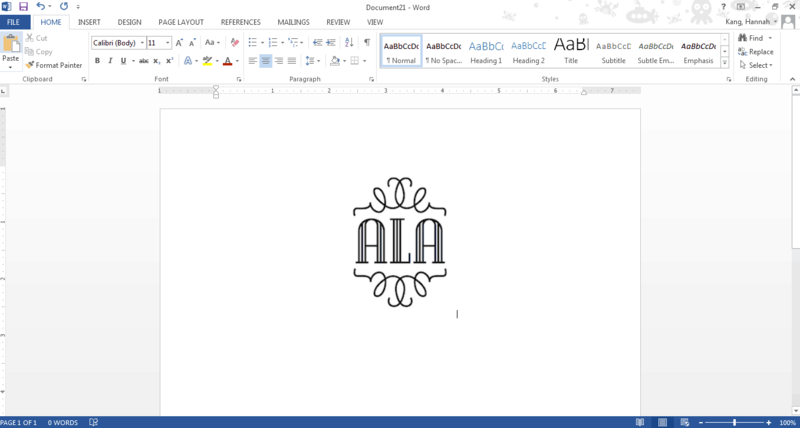 I opened my word processing program and used some fonts and symbols on my computer to create the monogram you see above. I didn’t resize the paper; I left it the exact size to fit an 8.5” x 11” sheet. 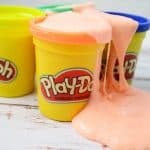 This is your chance to get creative, play, and have fun! TIP #1: This is the best time for you to personalize your monogram so don’t be afraid to play around with different fonts, sizes and designs! Print out your monogram and trim around the edge with the scissors. 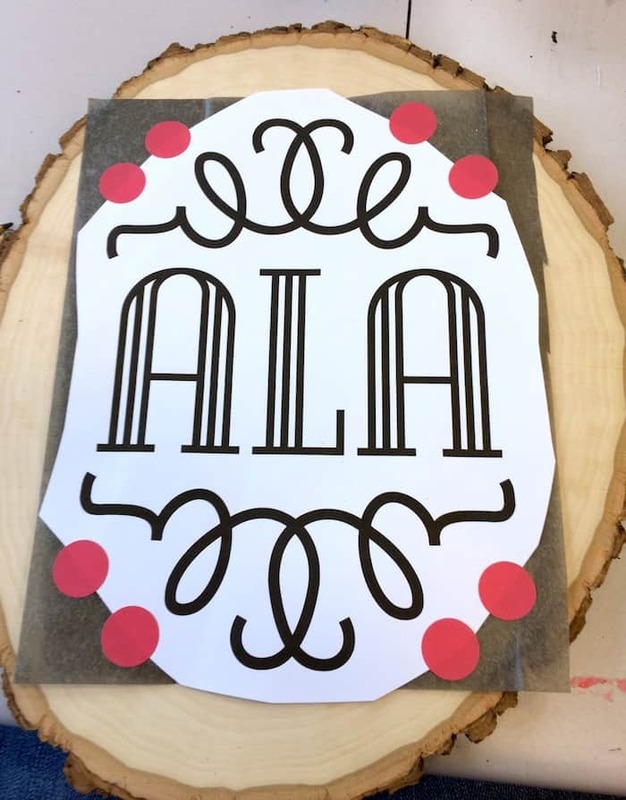 Place a piece of transfer paper between the monogram sheet and the plaque and tape down. TIP #2: Placement is important. 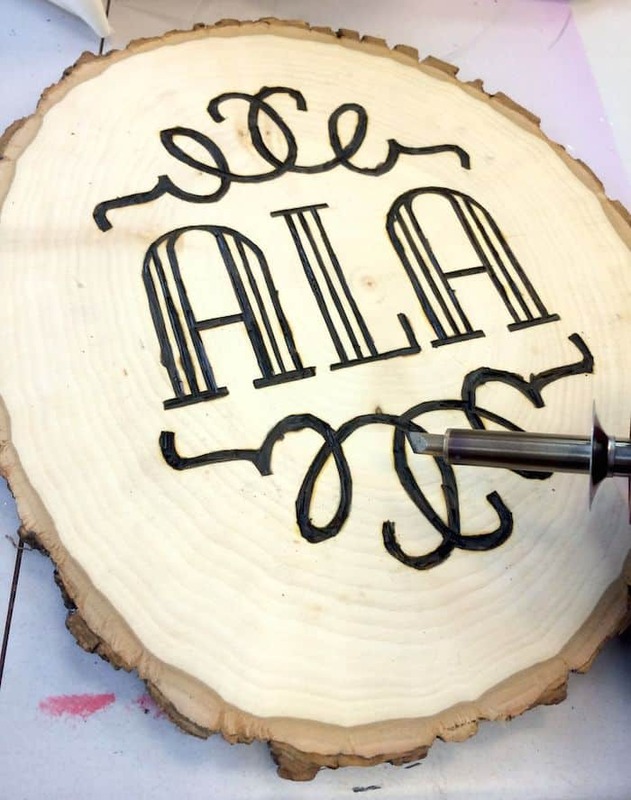 Lay down the monogram and transfer where you want the design to get burned on. 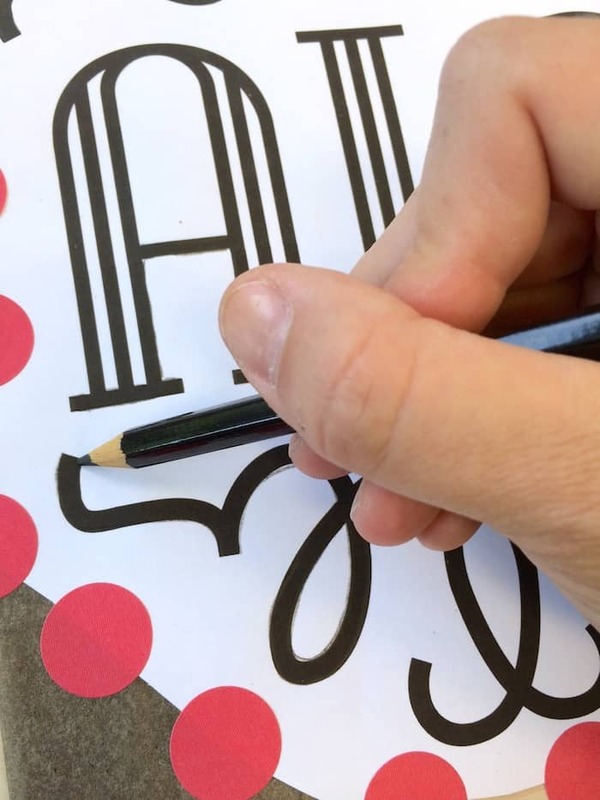 Trace the edges of the symbols and the letters with your pencil – you don’t need to fill them in. This will provide a guide for your wood burning. When you lift up your transfer paper, this is what your plaque will look like. The pencil transferred the graphite from the transfer paper to your plaque! 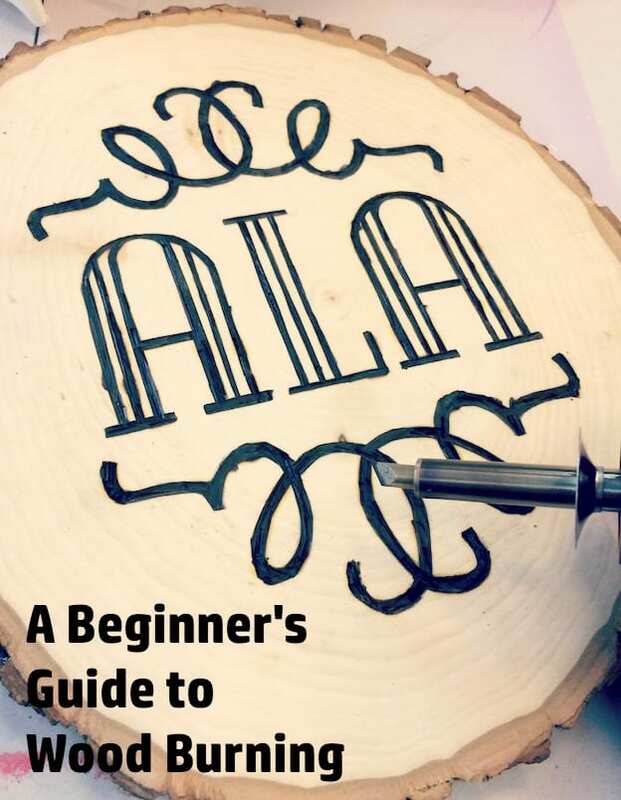 Now you have a guide for wood burning. Safety first! Make sure you read the instructions on your wood burning tool carefully before beginning. 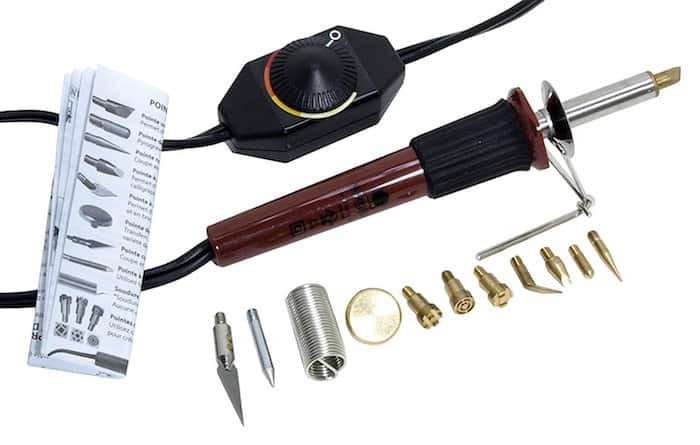 This tool gets hot, so be careful and use all of the recommended precautions! Once your tool is heated, begin burning. Start with straight areas to get practice, and then work up to the curved areas. TIP #3: I found that using the basic tip that came on the tool worked best for me (as opposed to some of the other tips that came in the package). I also had the best results at the highest heat setting! Continue burning the wood until you have completed the plaque. Wood burning is a slow process so do not try to rush it or you will make mistakes. Take a break if you need to. TIP #4: If you do have a few mistakes in your plaque, it’s fine – it simply adds to the character of the piece. I love the finished result, and I have to say, I’m addicted to burning wood now! I can’t wait to try some other patterns on wood plaques . . . even beyond letters. 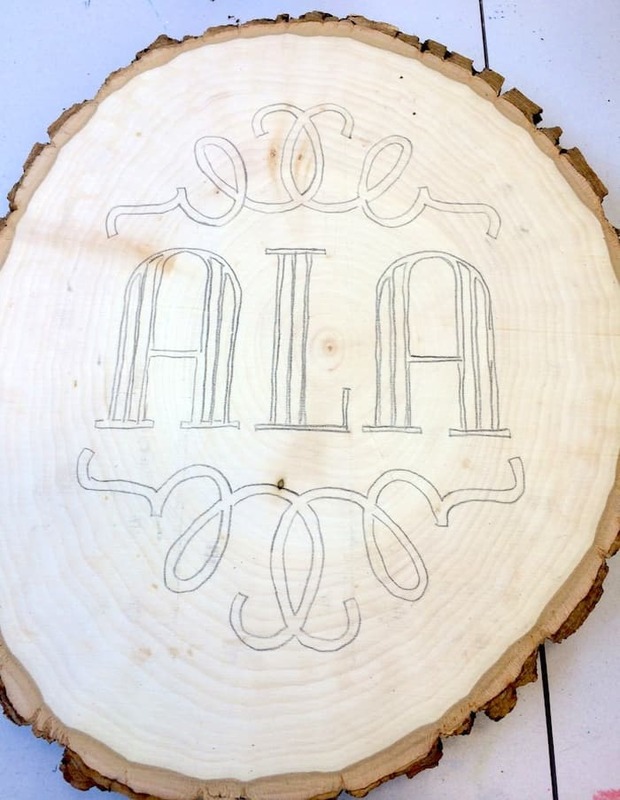 I love wood burning…..I did make a spacing mistake with my word spacing. Any ideas how to fix it so I can not mess it up. I broke the head of my tip off inside my pen. How do I get the piece out of my pen?